THE SKINNY: Mirenesse's Lip Bomb, which came in my first Ipsy box is a mix of a gloss, stain and lacquer. The pigment is vivid and glossy and it looks wet on your lips. The problem is, this product is wet on my lips, even though it is supposed to be non-smearing. I would highly recommend using lip liner with it. Mirenesse, in fact, says to apply this product in light layers, building up the color intensity gradually. The color lasted a few hours, typical of a gloss on my lips, and didn't dry out or feel gritty. This would be great for a short, special occasion. But it's too much trouble for every day use. I felt like I left smudges of this gloss everywhere I went. KEEP OR TOSS: Keep. The color really is gorgeous. 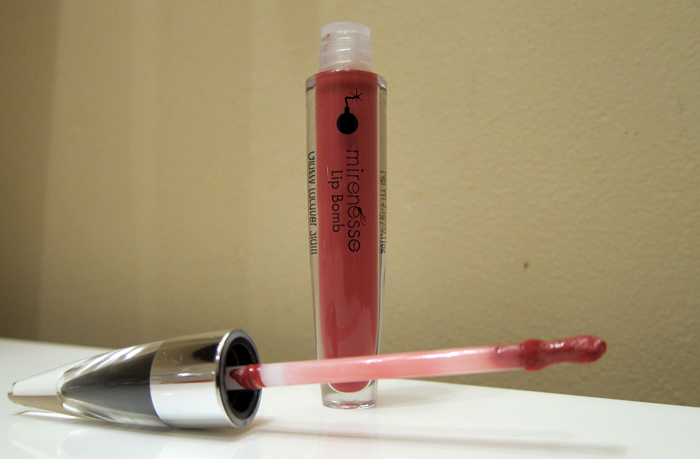 CHECK IT OUT: Mirenesse Lip Bomb comes in a variety of colors, groups on the website in reds, pinks and nudes.